Ultra Clear Screen Protector that is robust, incredibly clear, easy to use and is long lasting. A robust ULTRA CLEAR Screen Protector will prevent scratches and protect your Garmin iQue M5 LCD Screen whilst reproducing original colours. This screen protector is customised to fit your Garmin iQue M5 LCD Screen perfectly - no adjustments needed. It will improve the life of your valuable LCD Screen. 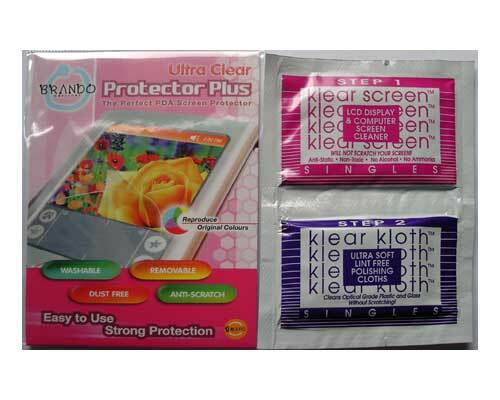 Brando Workshop Ultra Clear Screen Protector is the perfect screen protector to protect your screen from scratches and smudges. It is made of unique material which is extremely clear and highly durable. It is easy to apply. With special adhesive surface, you can remove and re-apply it without residue retaining on the screen. The best screen protector ever!